Nikki and I went up to Petaluma for the 4th of July to meet some of her family. We all ended up going to a local BBQ spot to have a nice, American lunch. :) We saw that the restaurant had Mac and Cheese on the menu, and so we both went for it. I do have to admit this up front: I usually have a bias against this style of Mac and Cheese. I usually prefer creamer Macs, with stretchy cheeses and firm al dente noodles. 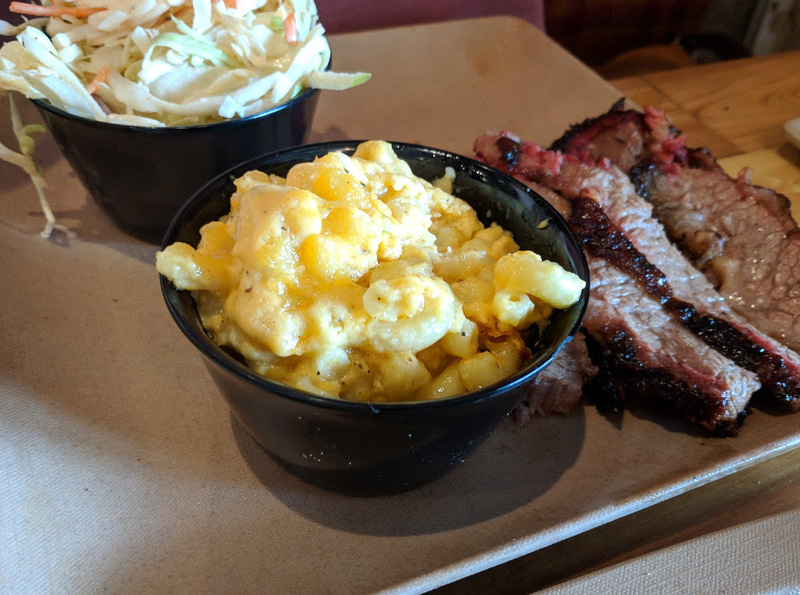 But many BBQ places will make their sauces extra thick, and purposefully overcook the noodles, so that the whole thing has the consistency of mashed potatoes. This place surprised me, however. Yeah, they did both of those things that I dislike: the noodles were a bit overcooked, and the sauce was so thick that it was almost crumbly. BUT, the Mac itself was very tasty and well made. They used asiago, pepper jack, and cheddar cheeses to make their sauce, and man, that sauce really really popped with flavor! The only downside was that this Mac was only a side dish. I could have eaten a full bowl of this stuff!